42.5 mm 18K 5N pink gold case, 13.7 mm thick, transparent back, screwed-down crown and quarter-turn screw-lock push-pieces, translucent silver-toned lacquered dial with sunburst satin-finish, caliber 5200 automatic movement with minutes, date in aperture, small seconds at 9 o'clock, column-wheel chronograph with 12-hour and 30-minute counters, hours, approximately 52 hours of power reserve, brown Mississippi alligator strap with black nubuck lining, bracelet , also delivered with additional brown rubber strap, interchangeable 18K 5N pink gold folding buckle. Water resistant to 15 bar. 42.5 mm stainless steel case, 13.7 mm thick, transparent back, screwed-down crown and quarter-turn screw-lock push-pieces, translucent silver-toned lacquered dial with sunburst satin-finish, caliber 5200 automatic movement with minutes, date in aperture, small seconds at 9 o'clock, column-wheel chronograph with 12-hour and 30-minute counters, hours, approximately 52 hours of power reserve, stainless steel bracelet , also delivered with additional black Mississippi alligator leather strap with black nubuck lining and a separate black rubber strap and interchangeable stainless steel folding clasp. Water resistant to 15 bar. 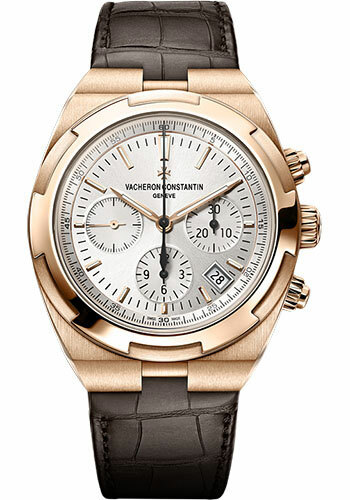 42.5 mm stainless steel case, 13.7 mm thick, transparent back, screwed-down crown and quarter-turn screw-lock push-pieces, translucent brown lacquered dial with sunburst satin-finish, caliber 5200 automatic movement with minutes, date in aperture, small seconds at 9 o'clock, column-wheel chronograph with 12-hour and 30-minute counters, hours, approximately 52 hours of power reserve, stainless steel bracelet , also delivered with additional brown Mississippi alligator leather strap with black nubuck lining and a separate brown rubber strap and interchangeable stainless steel folding clasp. Water resistant to 15 bar. 42.5 mm stainless steel case, 13.7 mm thick, transparent back, screwed-down crown and quarter-turn screw-lock push-pieces, translucent blue lacquered dial with sunburst satin-finish, caliber 5200 automatic movement with minutes, date in aperture, small seconds at 9 o'clock, column-wheel chronograph with 12-hour and 30-minute counters, hours, approximately 52 hours of power reserve, stainless steel bracelet , also delivered with additional blue Mississippi alligator leather strap with black nubuck lining and a separate blue rubber strap and interchangeable stainless steel folding clasp. Water resistant to 15 bar.